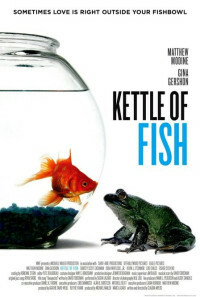 Mel is a musician in Manhattan, with plenty of one-night stands but no steady companion, except for his goldfish. He decides to move in with his current girlfriend, so he sublets his flat to Ginger, an English biologist new in town. The day he moves out, he flips for the bride at a wedding where he's playing, breaks up with his girlfriend, and moves back into his flat, negotiating with Ginger to her temporary flatmate. Meanwhile, he pursues Diana, the bride, working as the elevator operator in her building while he and Ginger develop a friendship as she does research on his fish. One of her lab frogs and his fish develop an attraction: is this a harbinger of opposites attracting? Regions are unavailable for this movie. Click the "Watch on Netflix" button to find out if Kettle of Fish is playing in your country.